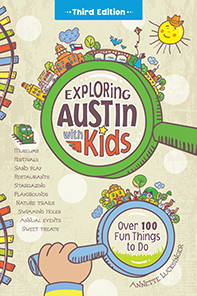 Exploring Austin with Kids News - Book Launch Party! Come on out to Hill's Cafe on Sunday, March 2nd, from 4:00-6:00 for the big book launch! There will be lots of fun kid activities in addition to the book signing! A juggler and balloon twister will be performing and tables of explorer crafts will be on hand to keep young adventurers busy. We'll be in the backyard. Hope to see you there! Hill's Cafe - 4700 S. Congress Ave.